Gallbladder Cancer treatment and surgery India offers information on Gallbladder Cancer Doctor India, Gallbladder Cancer treatment and surgery Hospital India, Gallbladder Cancer treatment and surgery Abroad, Gallbladder Cancer causes, symptoms, Risk factors, treatment and surgery. Abdominal pain. Many people with gallbladder cancer have some abdominal pain — usually in the upper right part of the abdomen. Nausea and vomiting. These symptoms can occur when a tumor blocks the common bile duct. Yellowing of your skin and the whites of your eyes (jaundice). Jaundice results from high blood levels of bilirubin — the residue from the breakdown of red blood cells. Normally, bilirubin is metabolized in your liver and eliminated through the bile ducts. But a blocked bile duct can cause bilirubin to accumulate in your blood. The built-up pigments may turn your skin and the whites of your eyes yellow and your urine dark brown. Because bilirubin isn't being eliminated through your bile, your stools also may turn pale yellow or white. Unintended weight loss or loss of appetite. Tumors can prevent the normal passage of food or interfere with its absorption by blocking the flow of pancreatic enzymes. Jaundice A yellowing of your skin and the whites of your eyes, along with tea- or coffee-colored urine and light-colored stools, are common initial signs of bile duct cancer. 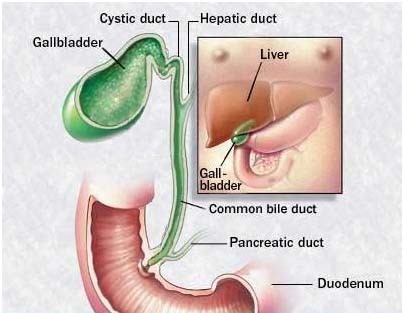 Enlarged gallbladder A blocked bile duct can cause bile to accumulate in your gallbladder, making it larger than normal. Although your gallbladder is hidden behind other organs in your abdomen, your doctor can sometimes feel this enlargement during a physical exam or it may be detected on an ultrasound. Intense itching (pruritis) When the flow of bile is obstructed by a tumor, bile salts may be deposited in your skin, leading to intense itching. Healthy cells grow and divide in an orderly way — a process that's controlled by DNA, the genetic material that contains the instructions for every chemical process in your body. When DNA is damaged, changes occur in these instructions. One result is that cells may begin to grow out of control and eventually form a malignant tumor — a mass of cancerous cells. Most gallbladder tumors develop in the cells that line the inner surface of the gallbladder. These tumors are most commonly adenocarcinomas — a term that describes the way the cancer cells look when viewed under a microscope. These solid deposits of cholesterol or calcium salts form in your gallbladder, they are the most common risk factor for gallbladder cancer. The stones may cause your gallbladder to release bile more slowly, which increases the amount of time cells are exposed to toxins. Although most people with gallbladder cancer also have gallstones, the vast majority of people with gallstones never develop gallbladder cancer. The chances of developing gallbladder cancer increase as you get older. Most people diagnosed with gallbladder cancer are in their 70s. Bile duct cancer is most common in those over 65. Women are at least twice as likely as men are to develop gallbladder cancer. They're also more likely to have gallstones because the female hormone estrogen causes more cholesterol, the main component of most gallstones, to be excreted in bile. But, bile duct cancers are more likely to occur in men than they are in women. The pancreatobiliary duct junction is the point where the common bile duct — which carries bile from your liver and gallbladder to your small intestine — joins the pancreatic duct carrying digestive juices from your pancreas. In some people, these two ducts connect in a way that allows pancreatic juices to back up into the bile duct and prevents bile from being quickly emptied into the small intestine. This may irritate the cells lining the gallbladder and bile ducts, increasing the risk of cancer. These are growths on the inner surface of your gallbladder. Most aren't cancerous, but polyps can contain malignant cells. Eating food high in carbohydrates and low in fiber may increase your risk of gallbladder cancer. People exposed to certain industrial chemicals, especially azotoluene, have an increased risk of developing gallbladder cancer. Thorium dioxide (Thorotrast), a dye once used in X-rays, can cause both liver and bile duct cancers. Although Thorotrast hasn't been used for decades, exposure to other toxic materials — including dioxin, nitrosamines and polychlorinated biphenyls (PCBs) — may increase your risk of bile duct cancer. If you are very overweight (about 30 pounds more than your ideal weight), you're at increased risk of gallbladder cancer. It's estimated that as many as one in every four cases of gallbladder cancer is linked to excess weight. American Indians, especially those living in the Southwest, are five times as likely to develop gallstones and gallbladder cancer as whites are. Hispanics also have higher rates of gallbladder cancer than whites do. This autoimmune disorder causes your immune system to attack your bile ducts. PSC creates scar tissue that narrows the bile ducts and prevents bile from reaching your intestines. Over time, repeated injury to bile duct tissue can increase the likelihood of developing cancer. Another autoimmune disease, ulcerative colitis is characterized by severe bouts of bloody diarrhea with abdominal pain and cramping. These include choledochal cysts, which is a dilation or stretching of the common bile duct, and Caroli's disease — a dilation of the bile ducts within your liver (intrahepatic ducts). Gallstones sometimes escape the gallbladder and enter the cystic duct, the common bile duct or, occasionally, the duct leading to your pancreas. These migrating stones can cause serious complications, including an increased chance of developing bile duct cancer. These are primarily a concern in Asian countries. Parasitic infections generally occur when humans eat fish containing the cysts of certain flatworms. The worms migrate to the bile ducts, where they damage the duct lining. Blood tests Your doctor may order tests to check for elevated levels of bilirubin or the enzyme alkaline phosphatase, which is released by damaged bile duct cells. You might also have tests to measure certain substances (markers) in your blood that sometimes indicate the presence of a tumor. People with bile duct cancer tend to have high levels of the marker CA 19-9. But CA 19-9 levels can be elevated in people with other types of cancer as well as in people who are cancer-free. For that reason, this isn't considered a definitive test. Ultrasound This test uses high-energy sound waves to produce images of your internal organs, including your gallbladder. It has no side effects, isn't invasive and generally takes less than 30 minutes. During the procedure, you lie on a bed or table, and a wand-shaped device (transducer) that emits high-frequency sound waves is placed on your body. The sound waves are reflected from your gallbladder back to the transducer and then translated into a moving image. Computerized tomography (CT) scan This is essentially a highly detailed X-ray that allows your doctor to see your gallbladder in two-dimensional slices. Split-second computer processing creates these images while a series of thin X-ray beams passes through your body. In most cases, you'll have a dye (contrast medium) injected into a vein before the test. By producing clearer images, the dye makes it easier to distinguish a tumor from normal tissue. A CT scan can also help determine if cancerous cells have spread to the common bile duct, lymph nodes or liver. Magnetic resonance imaging (MRI) Instead of X-rays, this test uses a powerful magnetic field and radio waves to create images. Used in combination with cholangiography — a test in which a small amount of dye is used to highlight the biliary tract — it can help determine whether the flow of bile is blocked or a tumor has invaded your liver. During the test, you're encased in a cylindrical tube that can seem confining. The machine also makes a loud thumping noise. In most cases you'll be given headphones for the noise. If you're claustrophobic, mild sedation may be an option for you. Endoscopic retrograde cholangiopancreatography (ERCP) In this procedure, an endoscope is passed down your throat, through your stomach and into the upper part of your small intestine. Your intestinal tract is inflated with air so that your doctor can more easily see the openings of the bile and pancreatic ducts, and a dye is injected into the ducts through a catheter that's passed through the endoscope. Finally, X-rays are taken of the ducts. Laparoscopy A more invasive procedure than ERCP, laparoscopy also uses a small, lighted instrument (laparoscope) to view your gallbladder, liver and surrounding tissue. But in this case, the instrument is attached to a television camera and inserted through a small incision in your abdomen. During the procedure, your surgeon may take tissue samples to help confirm the diagnosis of cancer. Laparoscopy is often used to confirm how far cancer has spread. Risks include bleeding and infection and injury to your abdominal organs or blood vessels. Biopsy In this procedure, a small sample of tissue is removed and examined for malignant cells under a microscope. It's the only way to make a definitive diagnosis of cancer. Biopsies of the gallbladder and bile ducts can be obtained in several ways. Your doctor may take tissue samples during laparoscopy. Or you may have fine-needle aspiration (FNA), a procedure in which a very thin needle is inserted through your skin and into your gallbladder. An ultrasound or CT scan is often used to guide the needle's placement. When the needle has reached the tumor, cells are withdrawn and sent to a lab for further study. Tissue samples can also be removed during or after gallbladder surgery. Resectable These cancers have not spread beyond the walls of the gallbladder or bile ducts and can be entirely removed in an operation. The term "resectable" refers to a cancer that can be removed. Unresectable At this stage, the cancer has spread to nearby lymph nodes or other organs such as the liver, pancreas, stomach or intestines and can't be completely removed. Recurrent This refers to cancer that returns after it has been treated. It may recur in the gallbladder or bile duct or in some other part of the body. If the cancer is more advanced, your surgeon will likely perform what's known as an extended cholecystectomy — an operation in which some liver tissue and nearby lymph nodes are removed along with your gallbladder. Once the cancer has spread beyond the walls of your gallbladder, it can no longer be completely removed with an operation. In that case, your treatment team will discuss other options with you. These may include radiation — either external beam radiation (high-energy X-rays) or implanted radiation "seeds" — or chemotherapy, which is anti-cancer medication. Perihilar tumors Tumors that develop where the hepatic duct leaves your liver (perihilar tumors) are usually treated by surgically removing a portion of the bile duct, the gallbladder and surrounding lymph nodes. Distal tumors Treatment for these tumors, located in the bile duct near your small intestine, is often by what's known as a Whipple resection. In this operation, your surgeon removes part of your pancreas, the common bile duct and your gallbladder, as well as a small portion of your intestine where the common bile duct and pancreatic duct enter the intestine together. Tumors that can't be removed When a tumor is too close to major blood vessels, your surgeon may suggest an operation to bypass some of your small intestine. This may help prevent further blockage of your bile duct and digestive tract and may also help relieve symptoms, but won't cure the cancer. If a bypass isn't an option, your surgeon may place metal or plastic tubes known as stents into the bile duct to keep it open. After surgery, your doctor may also recommend radiation or chemotherapy. Because standard treatments are rarely effective for advanced biliary tract cancers, you may want to consider participating in a clinical trial. This is a study that tests new therapies — typically new drugs, different approaches to surgery or radiation treatments, and novel methods such as gene therapy. If the therapy being tested proves to be safer or more effective than current treatments, it will become the new standard of care.